Alright if you are just joining in on the fun you might want to hop back to my recent post on selecting and preparing knit fabric. If you've already gone through the information (or knew it all before hand) then let's get started. The thing about knits is that they stretch, and they roll, and they pull. My first experience sewing with knit fabric was a bit traumatic, but after doing a bit of research, and applying a few techniques, my projects have improved. If you have the proper equipment, and a basic understanding of what stitches work well with knit fabrics, the whole process of working with knits becomes much easier. Ball Point Needles- I've mentioned this in an earlier post, but there is a sewing machine needle that is made specifically for working with stretch fabrics. 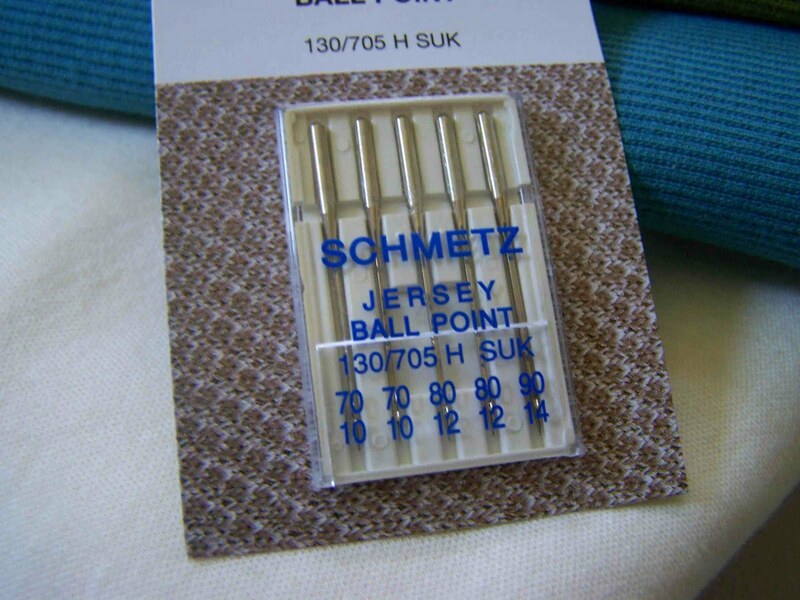 It is a ball point needle, but some of the cases actually say Jersey Knit needles. You can find them in most fabric stores and craft departments. Ball point needles come in a variety of sizes and are made by a number of different brands. The size of your needle should be determined by the weight of your material. Lightweight materials work well with ball point needles sizes 10/70 or 11/75. 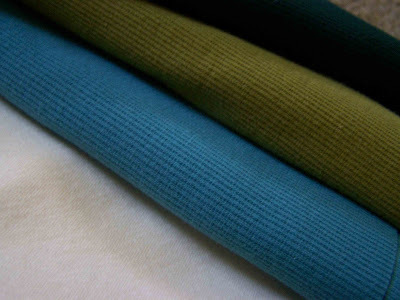 Medium weight fabrics work well with 12/80, and heavy weight fabrics are best with either a needle size 12/80 or 14/90. Size 11/75 is a pretty safe needle to have on hand. Thread: All purpose thread is suitable for most projects, but polyester, or cotton wrapped polyester thread will also work well. Shears: A pair of sharp fabric scissors are perfect for cutting your knit fabrics. A rotary cutter will also work well. Pinking shears are not ideal for knit fabrics, the pinking has a tendency to fray knits. Stabilizer: Because knits can be a bit unpredictable, it is nice to have some stabilizing paper or material on hand. Tissue paper, newsprint, adhesive tape, spray starch, or iron on water soluble stabilizer can all make sewing with knits a bit easier. Sewing Machine: Any sewing machine can sew knits, but some are definitely easier to handle. Newer machines often have some stitches built in specifically for stretch fabrics. I will discuss the stitches available on my machine, but if you have an older model all is not lost, you can still successfully sew with knits. Serger: This is one thing that I'd really love to have. Sergers are great for finishing raw edges and giving your project a finished look. Sergers are by no means necessary, but are nice to have on hand. 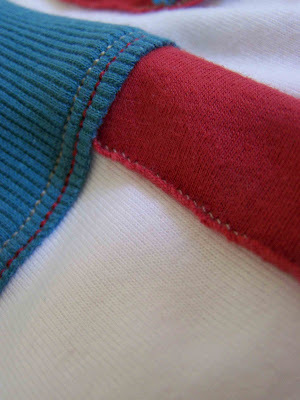 Stitches: Because knits are by nature stretchy, stretch must be added into a seam as you sew. If there is not enough stretch in a seam then threads tend to break. Using the proper stitch for your fabric can prevent future headaches and garment repairs in the future. I mentioned in my previous post that I learned a lot reading through my sewing machine manual. I would highly recommend pulling out your machine's manual (or find it online like I had to) and reading through which specialty stitches are built into your machine. Once you have done your homework test out all of the built in stitches on a swatch of fabric that you will be using. Doing so will allow you to find the stitches that will work for your particular project. If you are making a fitted garment it is always a good idea to baste your seams together before stitching (many of the specialty stitches are a pain to unpick). 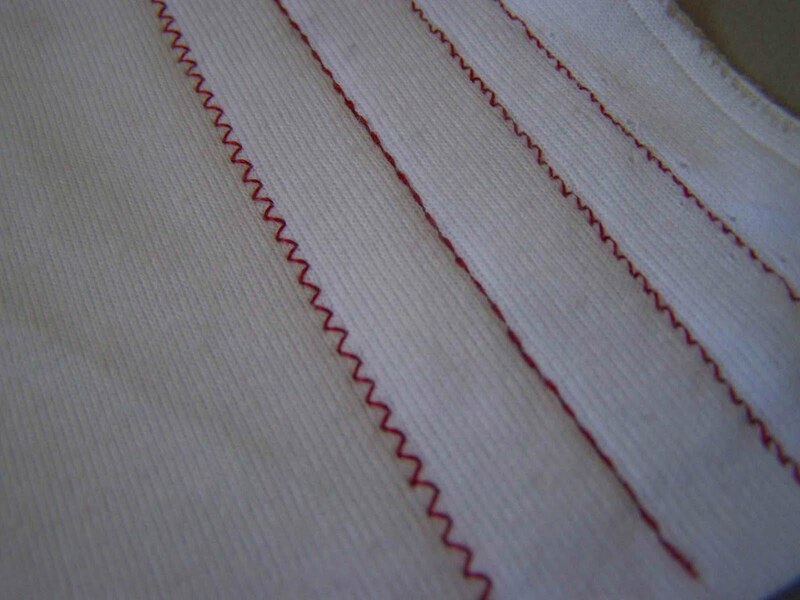 Most machines have a few basic straight stitches suitable for stretch fabrics. If your machine does not have any of these stitches available you can always go about it the old fashioned way. In order to do so you will need to slightly stretch the fabric both in front of, and behind, the presser foot. This will allow an even amount of fabric to be fed through the machine. Stretching the fabric will also allow the stitches to be a bit looser once the fabric relaxes, this will prevent thread breakage later on. I read in one book that it is best to have 9-10 stitches per inch. You may need to adjust your stitch length to achieve the 9-10 stitches. Triple Stretch Stitch- This is one of those stitches that I had no idea way created for knits. I love this stitch. I've used in on velcro, quiet books, bibs, ect. This stitch combines a forward stitch with a back stitch, followed by another forward stitch. So just as the name implies it is a triple stitch. It is machine stitch 2 on my Brother machine. It takes a bit more time and thread to use this stitch, but it is well worth it. 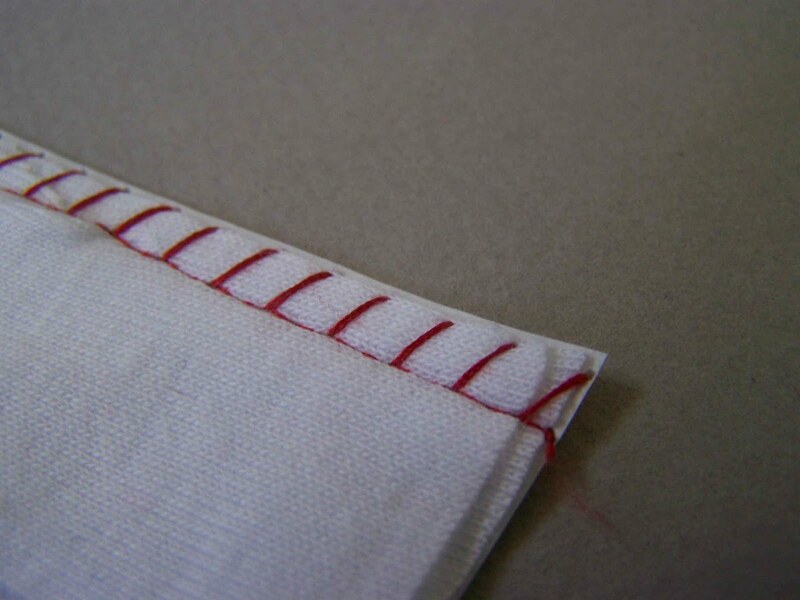 It is especially nice to use when attaching sleeves or sewing inseams. you can also use it as a reinforcement stitch on some of your other projects. I used this stitch on my son's pajamas for most all of the seams. It seemed to work well, and I love the way it looks on the applique. I am guessing that the reason it is well suited for knits is because each stitch is reinforced and is less likely to break. 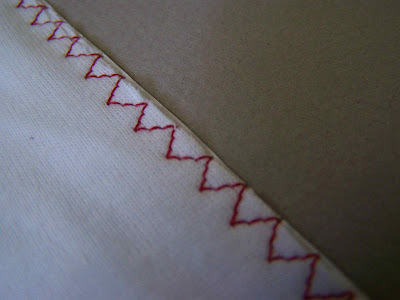 Narrow Zig-Zag Stitch- This is a great stitch to use for knits that don't curl on the edges. It is a fast and easy stitch to use. It is really narrow so it can be used on virtually any seam. I used it when attaching the red bands on Mr. C's pajama bottoms, and also as a security stitch on the hem of his pajama top. On my machine this is option number 3. 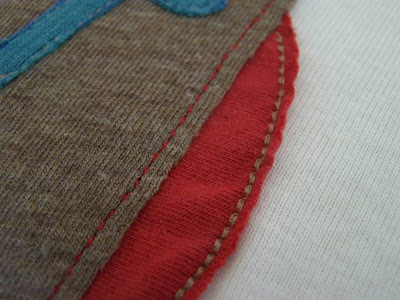 Overcast Stitches: Knit Fabrics do not fray on the edges, so seams do not have to be finished. That being said, I think that finishing off the edges gives garments a polished look. Here are a few options if you choose to finish your edges. Straight with Overedge Stitch-This is stitch option 8 on my machine. 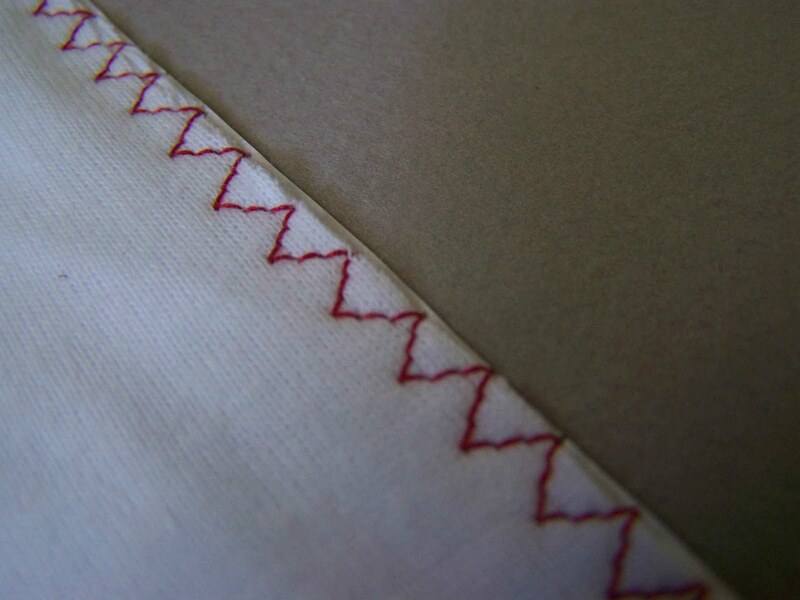 It combines a straight stitch with a diagonal stitch. It is a great way to both stitch your sew and finish your seam at the same time. I haven't had great success with this with my ballpoint needle. 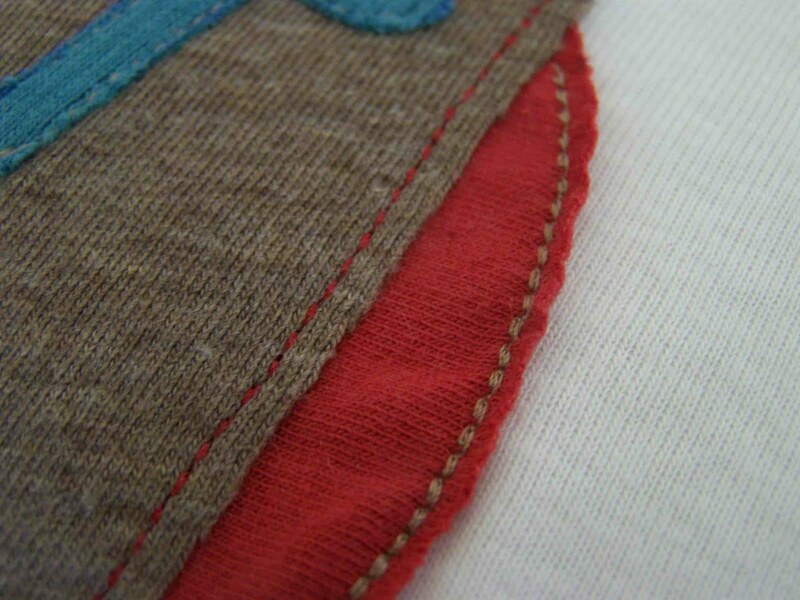 I think that the bulk of the seam is difficult for my machine on the diagonal stitch. Your machine might not be quite as temperamental as mine, but it is definitely worth a shot. Oh how I love finished edges. Three Poing Zig-Zag Stitch- Option 5, is a great not only for darning, and attaching elastic, but is wonderful for stretch fabrics. It can be used to overcast and finish your raw edges. It's a great little stitch. Serger- Okay, for all of you fortunate enough to have a server hop on over to mirelap for information on the best way to finish your raw edges. 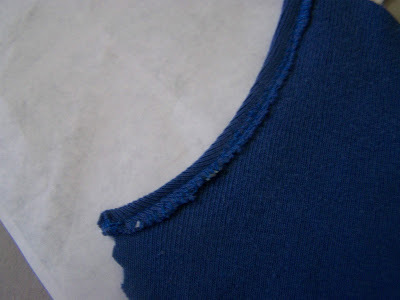 She has a wonderful post about not only finishing knit edges, but also on working with stretch fabrics. I mentioned this is an earlier post, but I read this wonderful post by Rae of Made by Rae, about how she'd trick her machine into thinking that it was sewing paper instead of knits. She'd put a piece of paper cut to the size and shape of her fabric pieces and stitch on top of it. I tried it, and it works great. I must warn you that this is a technique that is best suited for straight stitches (don't try it on zig zag or overcasting stitches...you'll regret it). She mentioned that the thinner the paper the better. I have tried newsprint, tissue paper, and printer paper. The tissue paper definitely worked the best. I found that it was much easier just to put the paper on the bottom of the stack of fabric (rather than on top), that way I could see the fabric that I needed to sew, and I didn't have to cut it to shape. Mirela of Mirelap has great suggestions for stabilizing your stretch fabrics. She suggests using a spray starch to give your fabric a bit more rigidity, she also recommends using a water soluble stabilizer (this I've yet to try), another option is using an adhesive tape that runs along your seam, it assists in keeping the fibers of your fabric in place while stitching. It can also be removed or cut off when you are done. Hopefully with a bit more understanding of the nature of knits, and the best suited equipment and stitches, your next knit project will be a success. Now hop over here to see how Mr. C's pajamas turned out. A couple years late but great info!